The Bridge Chamber is first mentioned in the records in the wardens’ accounts for 1398, but little is known about the medieval bridge chamber. During the reformation of the bridge administration in the late 16th century, a new bridge chamber was constructed between July and September 1585. This building comprised the upper storey of a newly built house adjoining the redundant bridge chapel on the north and featured a stained glass window of Normandy glass displaying the arms of Elizabeth I. In 1627, a new bridge chamber was constructed above the western entrance to The Crown Inn yard at the cost of £101 4s. 5d. Approached from a staircase in the inn yard at the rear of the building, this 17th-century bridge chamber, or audit chamber as it was called in the accounts, was furnished with tables, two red leather chairs, and twelve stools for the meetings of the two wardens and 12 assistants. In 1735, this furniture was replaced with a set of 14 walnut chairs, followed in 1785 by a further set of 14 mahogany chairs, both sets inlaid with the wardens’ coat of arms. Painting by 19th-century Rochester artist John Hopper. Print from John Thorpe’s Custumale Roffense (London, 1788). In 1735, under the leadership of the Senior Warden Dr. John Thorpe, the decayed ancient porch at the west end of the adjoining bridge chapel was taken down and a new facade of Portland stone erected in its place. On the ground floor this porch allowed access to the chapel, which since the suppression of chantry chapels during the Reformation had been refurbished and let as a dwelling house. On the first storey this porch, furnished with wainscot presses, housed the muniment room for the bridge records. A door opening into the bridge chamber allowed the wardens access to the bridge records. 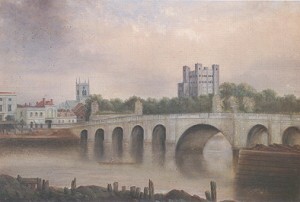 The 19th-century painting to the left shows the position of the bridge chamber and chapel at the Rochester end of the medieval stone bridge. 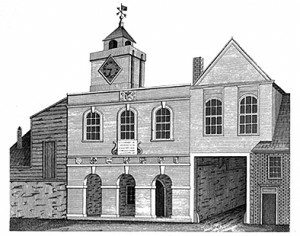 The 18th-century print above shows a close-up view of the western entrance to The Crown Inn yard with the bridge chamber above and the adjacent bridge chapel with its stone porch and first-storey muniment room. In the background can be seen the bridge clock on the chapel tower, which was pulled down in the early 19th century.